JULY 1, 2016, LIBREVILLE, Gabon – One hundred nine French, Gabonese and U.S. paratroopers with the 2nd Brigade Combat Team, 82nd Airborne Division, completed two multinational jumps into Pointe Denis landing zone during United States Army Africa’s Central Accord 2016 in Libreville, Gabon, June 22. 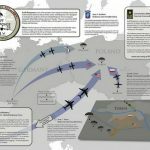 CA16 is an annual, combined, joint military exercise that brings together partner nations to practice and demonstrate proficiency in conducting peacekeeping operations. 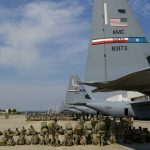 Multinational airborne operations demonstrate interoperability as the U.S. aims to build relationships with its partner nations in Africa. As a show of unity, U.S. paratroopers traded equipment with the French and Gabonese jumpmaster teams in order for each nation to earn the others’ jump wings (parachutist badge). 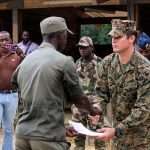 “This is our opportunity to train the French and Gabonese on our standard operating procedures and how we conduct airborne operations,” said U.S. Army Staff Sgt. Jason Tullos, the drop zone safety officer with the 2nd Battalion, 325th Airborne Infantry Regiment. 82nd paratroopers jumped with the French TAP 696.26 parachute and the Gabonese chute, a version of the T-10 previously used by the U.S. Those that jumped with French equipment and jumpmasters earned French wings while the paratroopers that jumped with Gabonese jumpmasters and equipment earned their Gabonese wings. For the 82nd, jumping with foreign equipment and jumpmasters on foreign soil earns a paratrooper the right to wear foreign wings. “It’s bigger than that, there’s that memory that goes along with it,” said Spc. Alex Detrolio, a medic with the 82nd Airborne Division. Detrolio earned his Canadian jump wings in October 2015 and his Gabonese wings with the June 22 jump. Spc. Randall Baker, a medic with the 82nd Airborne Division, said that he takes pride in getting to do something with a foreign country while also learning about their culture and people. Also, having an extra badge to wear on his uniform speaks of his accomplishments as a Soldier. Prior to the jump, all participating jumpers completed new equipment training (NET) and the basic airborne refresher (BAR) course to get everyone acquainted with the new equipment. 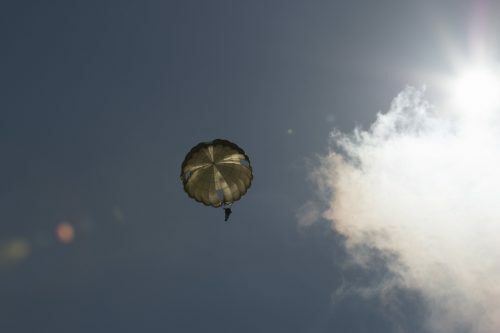 Because the NET and BAR course included an introduction and instruction on French, Gabonese and U.S. equipment, many of the paratroopers were able to earn both sets of wings during the two days. “These are my first set of foreign wings,” said U.S. Army Spc. Jeffry Jones, paratrooper with 2nd Battalion, 325th Airborne Infantry Regiment. Jones jumped with French equipment on day one and Gabonese on day two. 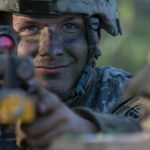 “It’s and honor to jump on foreign soil with another army’s paratroopers and I can’t wait to do it again,” said Jones. For the second jump, the paratroopers jumped onto Pointe Denis for an audience of distinguished visitors to include the U.S. Ambassador to Gabon Cynthia Akuetteh, U.S. Army Africa Commander Maj. Gen. Joseph P. Harrington, and U.S. Army Africa Command Sergeant Major, Command Sgt. Maj. Christopher Gilpin. All in all, the paratroopers said they enjoyed being able to work with their global partners on something that they all held in common.